Here, Booth breaks down the benefits of a few overachievers, and offers a recipe for a yogurt sundae that incorporates them all. Dark Chocolate that’s 60 percent or higher in cocoa content is best for your health. It’s high in antioxidants and magnesium and helps lower blood pressure and protect the heart. Research has shown that dark chocolate improves blood flow to the body surface, thus hydrating skin. It can also suppress coughs and improve memory. 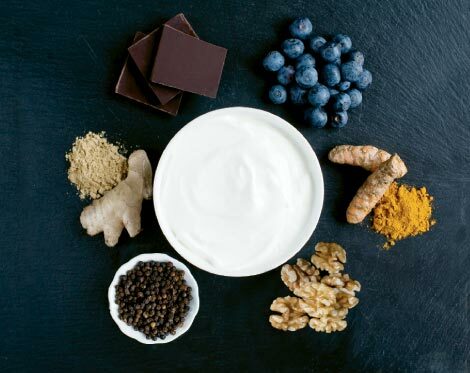 Yogurt deserves superstar status for its bone-strengthening calcium, phosphorus, and high quality protein. It contains active cultures of disease-fighting probiotics that support stomach and immune system health. Yogurts with added fruit and sugar are cleverly disguised desserts, so buy it plain and add your own flavoring to keep it healthy. Turmeric has been used in India to treat arthritis for thousands of years. It’s known to reduce inflammation and aid in digestion. This root is rich in curcumin, which has been shown to stabilize blood sugar and reverse insulin resistance. Walnuts top the list of nuts for monosaturated omega-3 fatty acids, making them useful for reducing inflammation and lowering cholesterol. This wonder nut is also high in antioxidants, vitamin E, selenium, and magnesium. Eating a handful of walnuts about five times a week can reduce the risk of heart attack by an average of 30 percent. Ginger alleviates nausea and vomiting, including bouts caused by morning sickness and chemotherapy. Black Pepper has been used since ancient times for its anti-inflammatory, carminative, and antiflatulent properties. It improves digestion by increasing enzyme activity. Preheat oven to 325°F. Place yogurt in ice cream maker, process, then freeze for an hour or until it reaches preferred consistency. Meanwhile, combine coriander, cumin, fennel seeds, and black peppercorns in a small skillet over low heat. Cook for two to three minutes, shaking constantly until the spices release a pleasant aroma. Transfer roasted spices to a bowl and allow to cool completely, then use a spice grinder or mortar and pestle to make a fine powder. Add turmeric, mustard seed, and ginger, and mix well. Line two baking sheets with parchment paper. Place nuts in a medium bowl and add corn syrup; toss to coat. Mix in spices, orange zest, and sea salt, and toss. Spread nuts evenly on baking sheets, and roast in oven until corn syrup is bubbly, 15 to 20 minutes. Cool completely. Make a fruit sauce by combining berries, sugar, and water in a saucepan over low heat. Bring to a simmer; cook, stirring occasionally, about 15 minutes. Allow to cool. To serve, scoop frozen yogurt into bowls. Top with nuts, sauce, and chocolate sprinkles.